The Alpina BL460SH 18" Self Propelled Petrol Lawnmower from Trenchex is powered by a reliable 145cc GCVx145OHV Autochoke Honda Petrol Engine with a self-propel feature to make maintaining the lawn much easier! The rear wheel drive pushes this mower to reach a speed of 3.7km/h giving you a steady pace of movement and allowing sufficient time for a thorough cut of the grass. The large cutting width of 46cm is ideal for mid-sized gardens and there is a choice of 5 cutting heights (27-80mm) available so you can select the perfect finish for your lawn. A generous 55L collection bag is included, alternatively you can opt to put the mower in rear discharge mode which will eject the grass clippings back onto the ground. 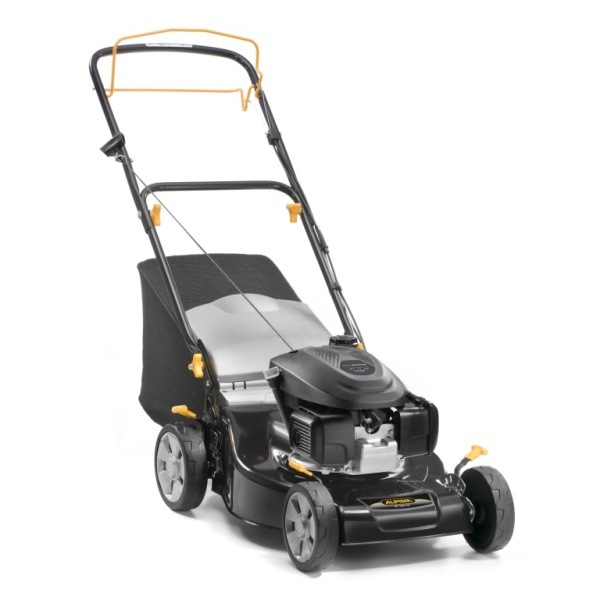 Manufactured with a robust steel chassis and self propelled this premium quality lawnmower is great value for money and is suitable for gardens up to 1200m2. A height adjustable, fold down handle is included as standard, providing additional comfort for taller users and making it easy to both transport and store.